Chronic second metacarpophalangeal joint dislocation and digital nerve injury and malfunction due to stretching. then following reduction. What is Finger Joint Dislocation? Finger Joint Dislocation involves a bone in the finger being put out of the joint. A normal finger joint has the curved ends of two bones moving against each other, with a smooth layer of cartilage on each side to allow easy and pain-free motion. With enough force, one of the bones can be moved out of place so that it no longer is in proper contact with the other bone of the joint. This now represents a dislocated joint. 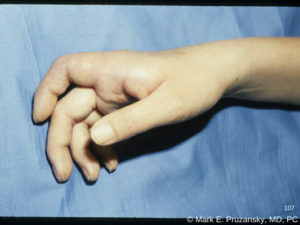 Any of the three joints (or knuckles) in a finger may be dislocated, though the middle knuckle is most common. Sometimes, one of the bones may have a fracture and torn ligament in addition to being dislocated. Pain and swelling are common. The finger generally looks deformed or crooked, with a bulge often visible on top of the finger. 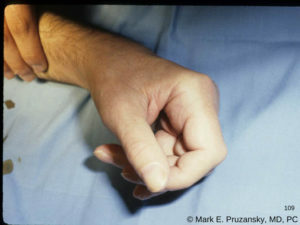 The dislocated finger is typically difficult and painful to bend, since the bones of the joint are no longer in correct alignment with each other. Diminished sensation and a cold fingertip indicate nerve and arterial circulation compromise. Finger Joint Dislocation usually results from a forceful impact to the finger, either by jamming the tip or hyperextending the finger. This type of injury commonly occurs in sports like Basketball and Football. Falling onto your hand may also lead to Finger Joint Dislocation. Speaking with you and carefully examining the injured finger are essential. An x-ray will confirm the diagnosis and assess for an associated fracture. Urgent relocation of the joint is required, which is usually accomplished by pulling on the finger. The finger is then treated by splinting or taping to provide support and stability, while the joint heals back in its anatomic position. Ice and anti-inflammatory medication normally are sufficient to manage pain, especially since the finger feels better once its back in place. Occupational therapy is often helpful to regain motion and strength. A Finger Joint Dislocation that is not diagnosed early becomes harder to put back in place just by pulling on it the finger. Even a delay of a few days causes the Finger Joint Dislocation to become stuck out of place. Surgery is then required to expose the joint and put the bones back into place. Unstable joints may require fracture and ligament repair to optimize function. If you believe you may be suffering from Finger Joint Dislocation, schedule an appointment with New York City hand surgeon Dr. Pruzansky today at 212-249-8700.